Seated on the bus and looking around, the first thing that stuck out to me was the trash strewn about all over the place. Keeping in mind that it was a late Friday night at this point, I figured that the bus had seen a pretty busy day. Something else I couldn’t help but notice was that the bus had an interior destination sign. Just like the front and side destination sign, it was showing the route number and info scroll. My first assumption was that for whatever reason, the sign had just been installed backwards. However, I found the same feature on multiple PAT buses throughout the weekend, so clearly this is something that they do on purpose. My theory is either it’s meant to help riders make sure they’re on the right bus (as many of the routes are branched, and there are many areas where multiple routes serve the same corridors), or it’s intended as a sort of operational redundancy in case one or both of the other destination signs are not working properly. About 15 minutes after first boarding the bus at the airport, I disembarked and headed towards my hotel in Robinson Township. The hotel I’d picked, Red Roof Inn, was one of several that fell under the range of my budget. I settled on the Red Roof Inn for the reason that it was within easy walking distance of the 28X stop. Since I was in Pittsburgh on a weekend, the 28X was my only in and out of Robinson Township, as all other bus routes serving the area don’t run on the weekend. None of the other hotels had any reasonable access via transit, so making that choice wasn’t incredibly hard. Perhaps the only downside to my choice of accommodations was actually getting there. The road my hotel was located on, Steubenville Pike, had no sidewalks whatsoever. When I stepped off the 28X at the last stop in Robinson Township, next to 1st National Bank, I waited for the bus to pull away so I could see what options I had for getting to my hotel. There was a marked crosswalk adjacent to the stop, so I figured I’d be safest using that. Though it was late at night, there was plenty of traffic to be seen. I tried waiting to see if anyone would actually stop for me, but it became apparent fast that nobody was going to even consider it. When I got a chance, I crossed across the first lane of traffic, making sure the approaching cars stopped for me in the process. I did the same thing for the next traffic lane, and then waited in front of the center turn lane to repeat the process with the traffic lanes on the other side of the street. I could tell that the drivers were annoyed that they actually had to take 2 seconds out of their time to stop their vehicles for me. Considering how far out in the Pittsburgh suburbs I was, I wasn’t shocked at all by this. After successfully crossing the street, I continued onward through the parking lot of a shopping center in an effort to avoid walking on the side of Steubenville Pike as much as possible. If I had just brought my backpack, it wouldn’t have been such a big deal. Since I had my rolling suitcase though, I ended up having to walk on the side of the road for a short distance. While I was never in any real danger of being struck by a car, I was largely disappointed that there were zero sidewalks to be seen in this part of suburbia. The next day, I made plans to meet up with Stuart Strickland, one of my Transit Nerd friends from Twitter. Before leaving to catch the 28X to downtown, I asked him if it was possible to get the ConnectCard on a weekly pass. Sadly, it was only available for purchase on the annual passes at that time, so I wasn’t going to be able to get one to add to my transit fare media collection. 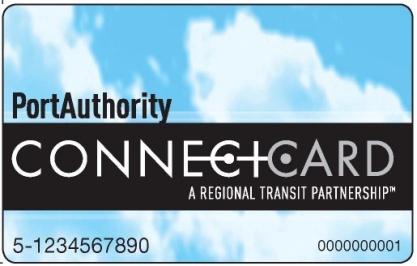 The ConnectCard is part of PAT’s effort to modernize their methods of fare collection. Using RFID-technology, it operates much the same as all other “smart cards” used by other transit agencies. Riders simply tap the card on a reader (the orange box from the farebox picture above), and their fare is paid. Stu had been lucky enough to be the very first person to buy a ConnectCard, so the bright side was that I would be able to see it in action. 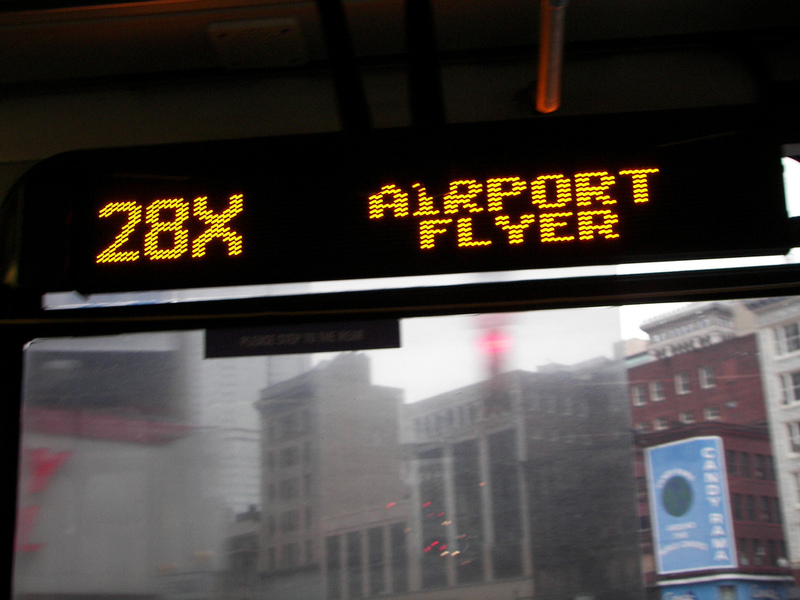 On the 28X again, I started making my way downtown. It was during this ride when I got a firsthand look at a Pittsburgh transit innovation: The Busway. Often referred to as America’s “first BRT system,” the busway was Pittsburgh solution to replace the loss of streetcar service in the 1960’s and address growing concerns of traffic congestion. Utilizing the former railroad ROW (right-of-way), PAT opened their first busway, the South Busway, in 1977. Following the massive success of the South Busway, PAT was able to build a second busway, the Martin Luther King Jr. East Busway, which opened in 1983. The West Busway (pictured above) was opened in 2000, and the MLK Jr. East Busway was extended 2.3 miles in 2003. There is also a HOV-lane system on I-279, running from downtown to Perrysville in the North Hills area of the metro, which has been in operation since 1989. 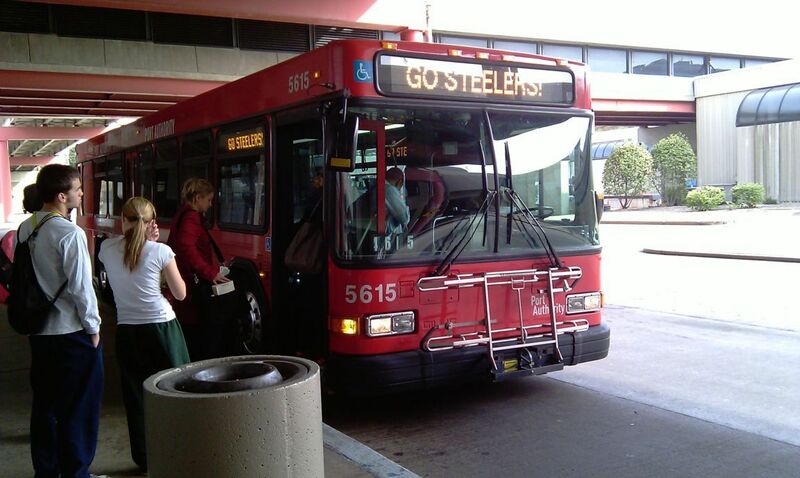 Pittsburgh’s busways also hold distinction as the only American BRT system to operate a “direct service model,” where local, limited, and express routes all serve the corridors. Routes are not limited to just the busway, as many will continue on local streets for an increased service area. Some routes, such as the 28X, branch off the busway and only serve part of the busway. If you look closely at the map of the West Busway above, you can see where I-376 crosses over just south of Bell Station. It’s at that intersection where the 28X (as well as Route G3) can access the busway via a bus-only ramp. As the bus continued down the busway towards downtown, I couldn’t help but marvel at how simple yet effective the busway was. In lieu of building fixed-rail to serve these corridors, PAT found a pretty elegant solution to increase access to transit. Though I meant to disembark the 28X downtown at the Liberty/Market stop, I ended up disembarking at the stop after, located at Liberty/Wood. As I walked back to the Liberty/Market stop, which was where Stu and I were going to meet up, I got my first real look at the downtown core, or the “Golden Triangle.” I’ve always liked city with tall buildings, and Pittsburgh did not disappoint. Even though it was a cold March day, much less a Saturday, there were plenty of people to be seen on the streets. Of course, many of them were in cars, but an impressive number of people were walking and biking. A few minutes after I got downtown, Stu rolled up on his bike. After we found a place to lock up his bike, we went to Market Square and got some chili at Primanti Brothers. Warmed up, we then went back out onto the streets and made our way to a bus stop, where we caught Route 51. After a short, standing-room only ride over the Smithfield Street Bridge (the oldest steel bridge in the US), we disembarked and walked over to the Monongahela Incline. 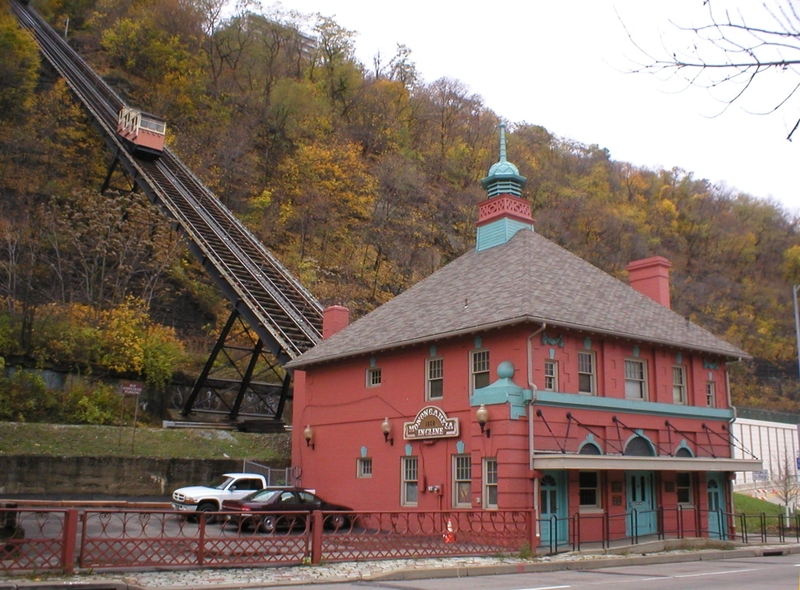 Built in 1870, the Monongahela Incline is the oldest funicular railway in the US. Along with the nearby Duquesne Incline, they are the only inclines left standing in Pittsburgh today. At one time, Pittsburgh had as many as 17 passenger inclines on Mt. Washington, along with multiple freight inclines. As we walked inside the lower station, I couldn’t help but think it looked like a miniature train station. The car on the left track was just pulling in, so we walked up to the left “platform” and found some seats. The cars weren’t built with a level passenger compartment, but rather three separate passenger compartments, following the grade of the incline itself. After waiting for a short minute, the doors were closed and we started our ascent up Mt. Washington. The ride itself wasn’t that long, but the view of Pittsburgh probably made it seem longer, which wasn’t a bad thing. At the top of the incline, we stepped off the car and made our way to the street. Unlike the station building at the bottom of the incline. this building had a station attendant stationed next to the fare box. Stu had let me borrow his son’s flash pass, so I just showed it to the attendant, while he took his ConnectCard and tapped it on the farebox. The attendant remarked that it was the first ConnectCard he’d seen being used. 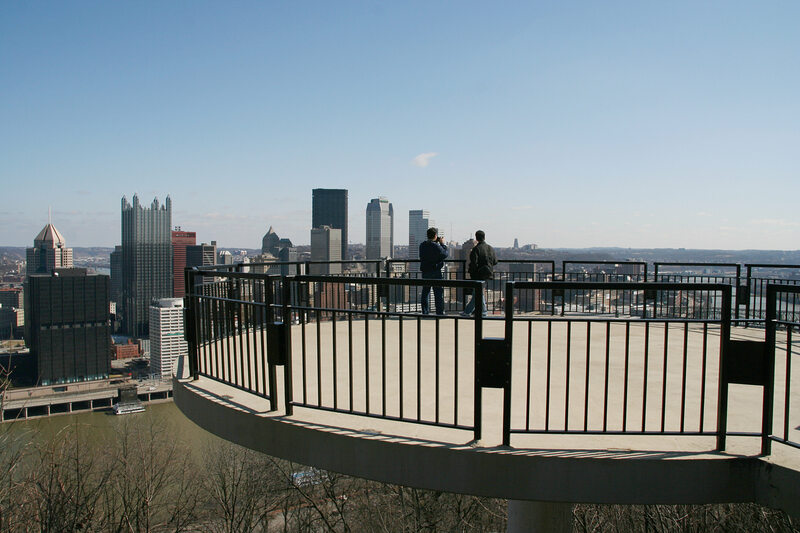 Near the incline station was an observation deck, so we went to go check out the view of the Pittsburgh skyline. 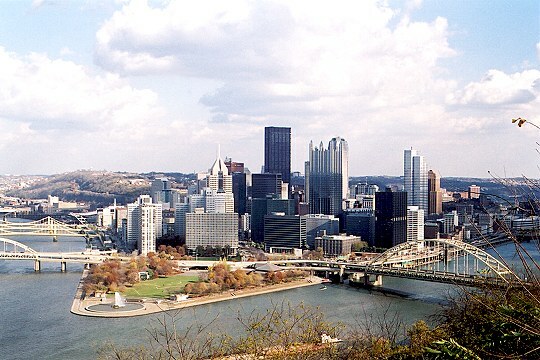 Pittsburgh has always been well known for the immense number of bridges in the city, and from the top of Mt. Washington I could see quite a few of them. Since it was a bit cold outside, we didn’t stick around for too long, electing to go back down to the bottom of the incline to try out another mode of transit. 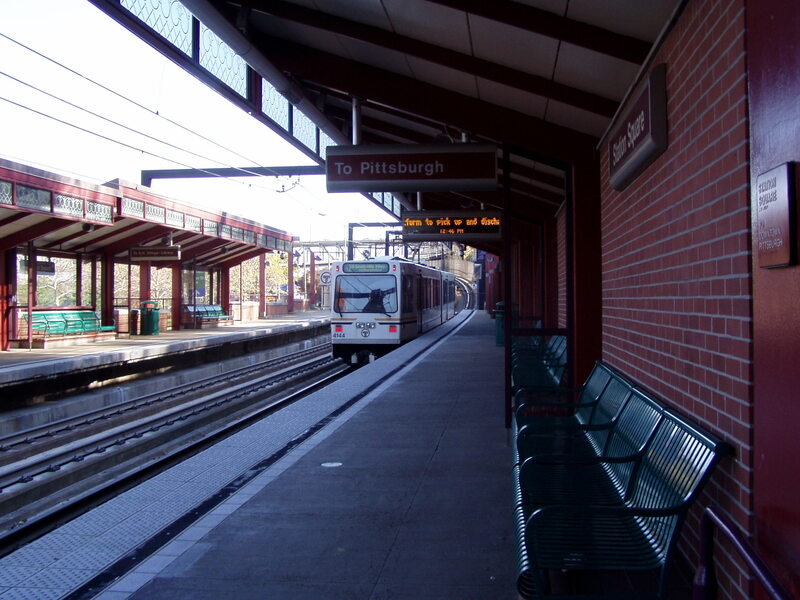 Next to the Monongahela Incline is Station Square Station, one of the stops on Pittsburgh’s light rail system, referred to as the “T.” The T first started operations in 1985, after the opening of the South and East Busways. Two routes, the Red Line and the Blue Line, are in operation today. The Red Line runs from Downtown to Overbrook Junction through the Beechview neighborhood, with select service continuing on to South Hills Village. The Blue Line runs from Downtown to Washington Junction via the Overbrook neighborhood. From Washington Junction, the Blue Line is brached, with some trains going to South Hills Village and the others going to Library. In the past, there was a third route in operation, the Brown Line. This route operated from Downtown to South Hills Junction via the Allentown neighborhood. Before being discontinued last year, the Brown Line had been whittled down to peak-only service, with local bus service covering the area the rest of the day. The Brown Line’s former route still remains in use today, as it provides an alternative route for Red Line and Blue Line trains when they can’t pass through the Mt. Washington Tunnel. As we made our way up to the platform at Station Square Station, we passed by an attendant booth. Just like at the upper station on the Monongahela Incline, I simply showed the flash pass. Stu showed the attendant his ConnectCard. This attendant had also not seen one of these in use before, and I got the impression that he wasn’t sure of the validity of it at first. Stu had been carrying the receipt from his purchase of his annual pass ConnectCard with him, so he was able to prove to the attendant that it was legitimate. Something I started wondering about is what would happen to station attendants as PAT moved to full-integration of the ConnectCard system. Will they just lose their jobs, or will PAT keep them on staff as fare inspectors in a POP (proof-of-payment) system? 5 minutes after we’d walked up to the inbound platform, a LRV arrived at Station Square Station. Perhaps the most noticeable feature on LRV is the doors. Throughout the system, there are stations with elevated platforms and low platforms. Because of this, PAT bought LRV’s with doors that could be used at both heights. The door at the very front can only be used at low platform stations, while the 3 doors behind it at used at high platform stations. 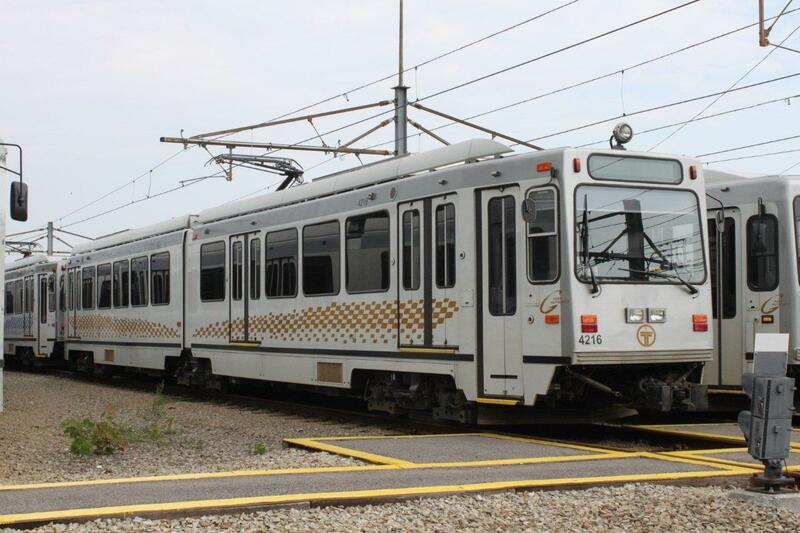 The LRV’s are double-ended (meaning there are operator cabs on both ends), so the door pattern is repeated on the other side of the vehicle. Inside the vehicle were some other oddities. 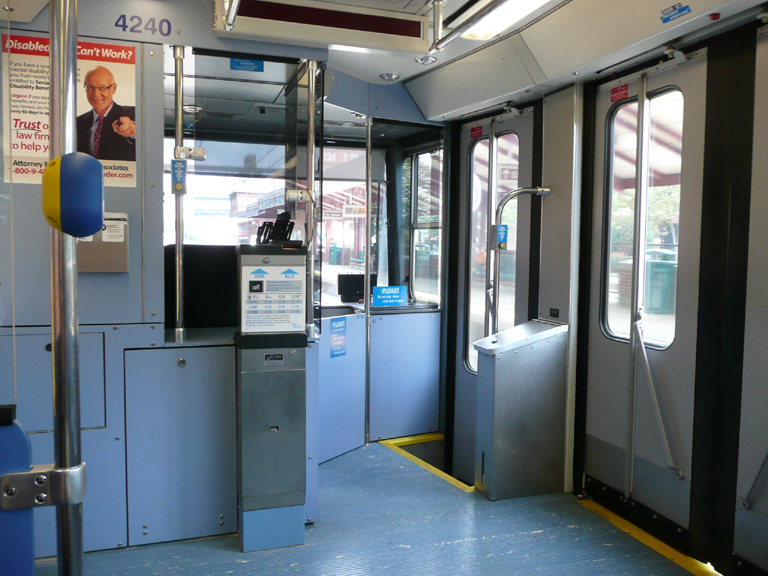 Unlike most other light rail systems in North America, PAT had fareboxes inside the LRV. Part of this stems from the fact that only some of the stations have station attendants/TVM’s that passengers can use to pay their fare. At all other stations, the LRV operator conducts fare collection. It may depend on the operator on how they do this. Some may just leave it up to the passengers to do the right thing, while others may turn around to check for fare payment. (Note the location of the farebox directly behind the operator cab.) I’m sure PAT has an official policy on this matter, but I didn’t get a chance to see it in action while I was in Pittsburgh. Another oddity was the seating arrangement, a 2+1 set-up, which had been recently updated with new 4One “Aries” seats. While not rare by any means, it’s not common to find this arrangement on North American transit systems. I’ve only seen it a few times before, on NYC’s buses, Seattle’s RapidRide routes, and Vancouver BC’s SkyTrain. With more room for standing passengers, it increases the capacity of the vehicle, helpful on routes with high ridership. From Station Square Station, we crossed over the Panhandle Bridge and made our way downtown. After passing through First Avenue Station (directly on the other side of the Panhandle Bridge), we disembarked at the next stop at Steel Plaza Station. The busiest stop in the system, the station was very wide and open. I also noticed that there was a third track on an island platform at the side of the station. While not dusty by any means, it seemed rather apparent that the platform wasn’t being used. I didn’t think much of it at that point, but I later learned how the third track actually continued on to a stop located at Penn Station. Opened at the same time as the rest of the system in 1988, the Penn Station stop had select service on all the routes. The line between Steel Plaza Station and Penn Station was single-tracked, which limited the capacity that PAT could serve Penn Station with. Over time, they ran fewer and fewer trains there, with all-day service being discontinued around 1993 and peak-service discontinued sometime after 2001. Every now and then, a LRV may serve the line as a shuttle during sporting events, or in special circumstances like a blockage of the East Busway. Back at street level, we walked a short distance to a bus stop on Forbes Avenue and caught a bus on Route 61C. Route 61 is one of several routes in the PAT system to have multiple branches. In this case, there are four different versions: Route 61A, 61B, 61C, and 61D. All four maintain separate schedules and maps, but share a common corridor between downtown and Oakland. In Oakland, each route branches off the the main corridor to serve different areas. It is with this method that PAT provides frequent service to a main corridor, with headways as high as every 3 minutes during peak hours. PAT also uses this method on another popular route, the 71, with 6 versions: Route 71, 71A, 71B, 71C, 71D, and P71 (serving the East Busway). After a quick ride through Oakland, often referred to as Pittsburgh’s “2nd Downtown,” we disembarked the bus at a famous Pittsburgh landmark: Dippy. Though Dippy stood quite tall, at an impressive life-size height of 22ft, it paled in comparison to the building across the street. 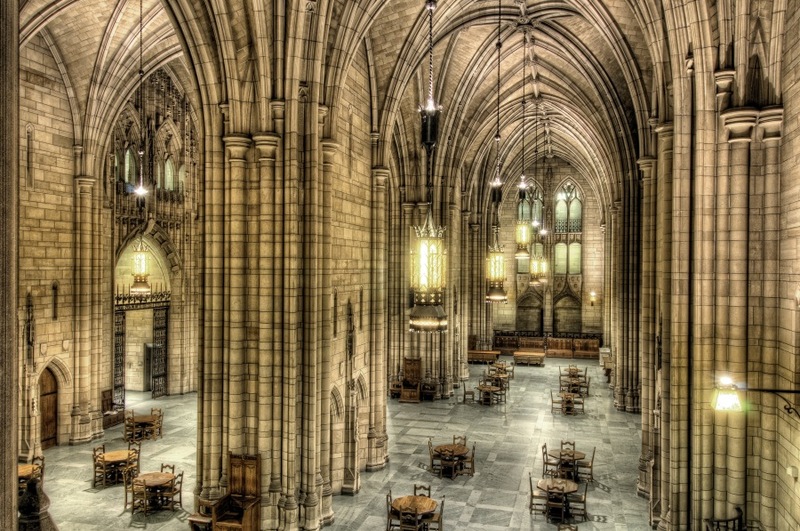 Standing 535 feet tall, the Cathedral of Learning is the centerpiece of the University of Pittsburgh campus. Just like many other structures in Pittsburgh, it was built largely with steel, though the exterior was finished with limestone. A remarkable sight from the outside, it was even more amazing on the inside. Being a bit of an architectural buff, I couldn’t help but marvel at the sight of the Commons Room. Just as impressive was the view from the top of the building. Taking the elevator up, we managed to get as far up as the 37th floor (there are 40 floors total). While we were up there, we saw multiple people ascending the stairs. 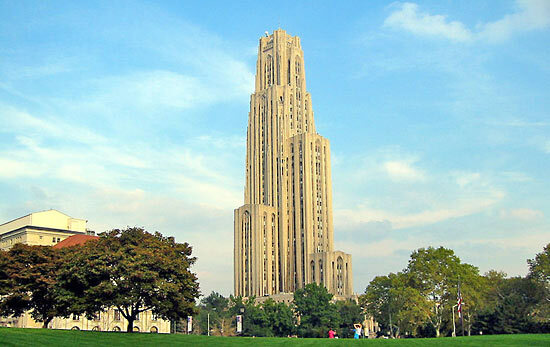 Even on the weekend, the Cathedral of Learning was a pretty popular spot for people who like to climb stairs. Before we left, we went back down to the Commons Room and checked out another feature of the building: the Nationality Rooms. Most of them were locked up, but we were able to sneak a peek in a couple of them. Back outside, we made our way over to 5th Avenue to catch a bus back downtown. As we were walking, I saw a couple of buses passing by. 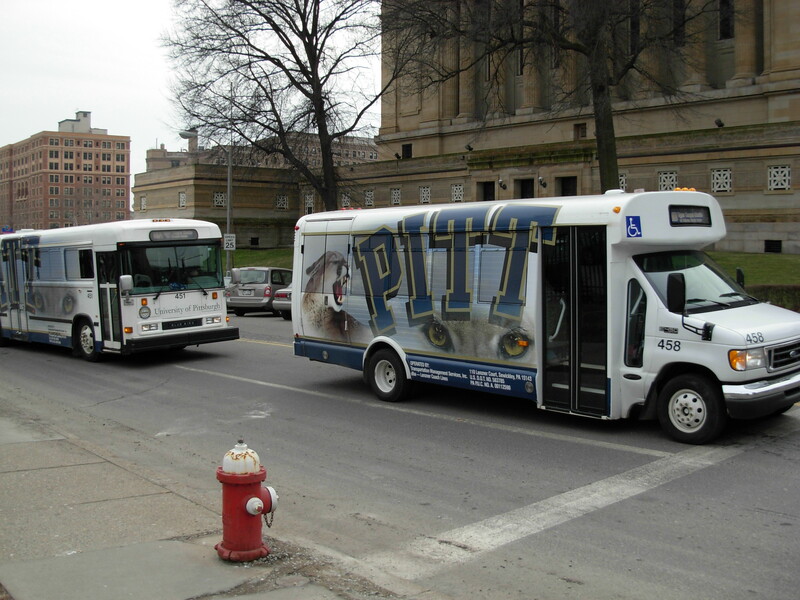 Clearly not part of the PAT fleet, these buses were actually shuttles for the University of Pittsburgh. Operated as a free service for all students, the system is largely centered around the Oakland neighborhood, shuttling students to and from classes and housing. 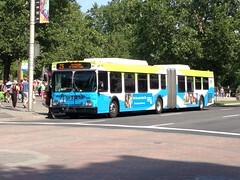 The fleet is mostly composed of Blue Bird buses, but there were also some cutaways floating around as well. 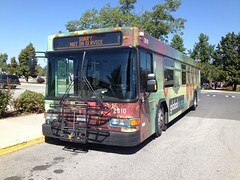 Students are also able to ride the PAT system for free, using their “Panther Card” as fare. 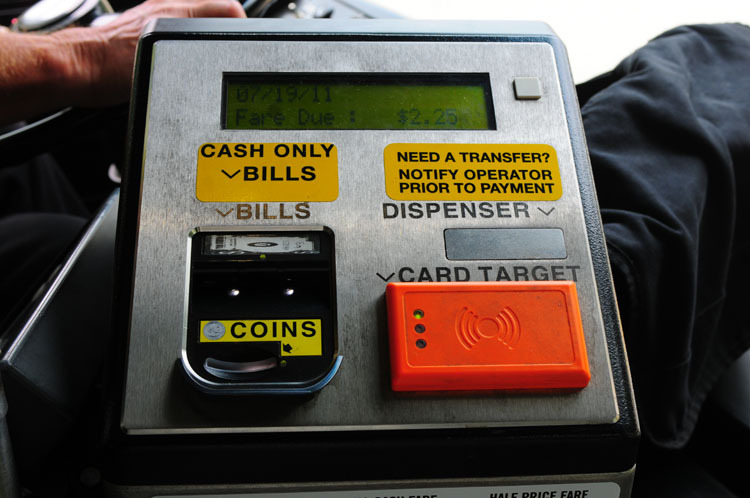 When boarding a PAT vehicle, a student just taps their card on the farebox card reader, just like the ConnectCard. Though I don’t know if it was system wide, I also saw that the shuttle stop had a digital message board for real-time info. In comparison, I only saw those at PAT light rail stations. Once on board Route 61D, we made our way back to downtown, disembarking near Wood Street Station. While on the way there, Stu pointed out an oddity of the Pittsburgh street grid. Before parting ways, we took a few photos for posterity inside the station. 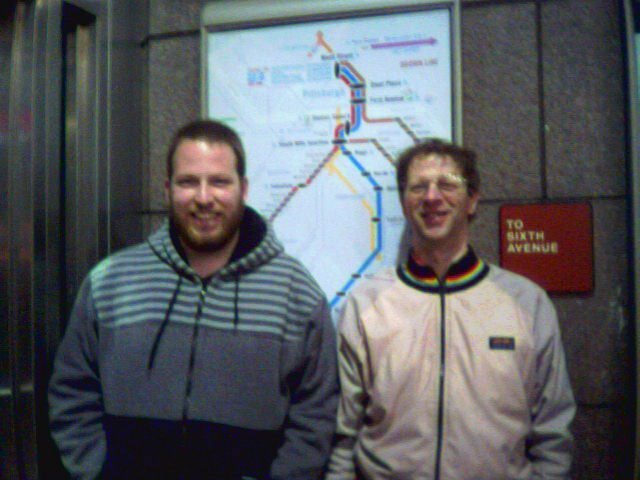 The map in the background is a out-of-date system map of the T. (As mentioned earlier, the Brown Line was discontinued.) After we went back to get Stu’s bike, we made our way to our bus stops, spotting a broken down bus along the way. After a short wait, I boarded the 28X back to Robinson Township. Checking my Twitter feed back at the hotel, I saw that Stu had been successful in catching the 12 back to his neighborhood in the North Hills. Though I was on vacation, I still had some work to do, which ended up taking a good chunk of my lazy Sunday. Eventually, I had to check out of my hotel, so I made my way over to a nearby coffee shop, Niko’s Coffee House. I wouldn’t have considered Pittsburgh much of a coffee city, much less the Pittsburgh suburbs, so I was pleasantly surprised at the quality of the mocha I ordered. While enjoying my mocha and the chocolate-covered coffee bean that came with it, I made plans with to meet up with Stu and some other local transit nerds I’d gotten to know through Twitter. After I made my way to the bus stop, I started talking with another person who was also waiting for the bus. It was obvious to him that I was visiting, and when asked why I told him that I wanted to check out PAT and see some friends. He then told me a bit about how the service cuts PAT went through had affected him. Keeping in mind that 15% had been cut last year and another cut of 35% was looking more and more likely to happen in September, along with the fare hikes that made PAT base fares among the highest in the country, I certainly sympathized with him and was grateful that I hadn’t gone through it. While waiting for the 28X to arrive, another bus happened to stop in the parking lot of the bank next to the bus stop. A cutaway operated by a non-profit called Airport Corridor Transportation Association (ACTA), the RideACTA shuttles provide transit service to areas that aren’t covered by PAT routes. The service is free for everyone, and will serve any destination within 1.5 miles of the IKEA store in Robinson Township. ACTA’s website also features a live-time vehicle tracker, so that passengers can know when to expect a shuttle to arrive. At the stop where I was waiting for the 28X, two women stepped off the shuttle and joined myself and the gentleman I’d been talking with to wait for the bus. 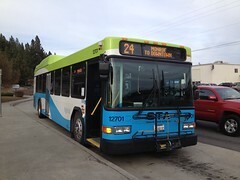 Eventually, the 28X did arrive, and the bus running on the route just happened to be one of the newest arrivals to the PAT fleet: A 2011 New Flyer D60LFR articulated bus. It was a good thing that the artic had been dispatched out that day, as the 28X was busy. With my backpack and rolling suitcase, I had to walk all the way to the very rear of the bus to find an open seat to sit in. It seemed odd to me that a bus with this many riders on a Sunday would even be considered for possible elimination, but sadly that had previously been the case. Facing a $64-million debt, PAT has had to undergo several rounds of proposed cuts as a result of the recession. Reportedly, PAT service today is about half that which existed in 2000. While some cuts were for efficiency measures, a large amount have been total eliminations of service which have left many transit dependent riders with little to no alternatives. Several times, the 28X has been proposed for elimination because of the cost of operation. Though I’m not sure how long it has been the case, the segment of the 28X between Robinson Township and the airport gets JARC grants as a large amount of airport employees use the route to get to their jobs. In the most recent proposal for cutting the 28X, PAT staff proposed terminating the route in Robinson Township, with no service to the airport. (Keep in mind that the 28X is PAT’s only route to serve the airport presently.) It seems silly, but sadly that’s the way things have become in the modern age of the Car. Local transit advocates have pointed blame at the Republican controlled state government in Harrisburg and Governor Tom Corbett, whose inaction in allocating funds to keep PAT afloat amid rising debt and operating costs have put PAT in the hole they’re in. After cruising along the West Busway and rolling through the “Golden Triangle” (Downtown Pittsburgh), I alighted the bus in the Oakland neighborhood just east of downtown. 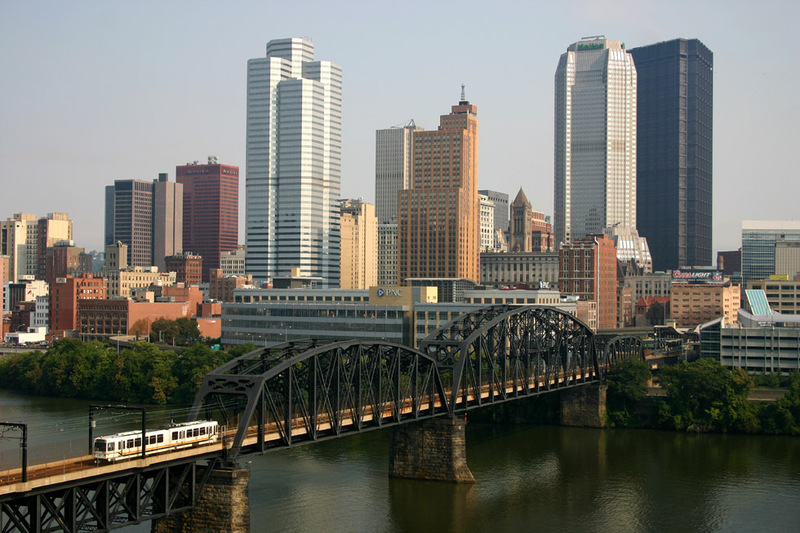 Often referred to as Pittsburgh’s “2nd Downtown,” Oakland is very much a college neighborhood, and most residents are students at one of several nearby colleges or universities. I alighted the bus at the Forbes/Atwood stop and walked across the street into Caribou Coffee. Inside, Michael Sypolt (creator of TransitGuru.info) and Ana Bayne (Chair of the PR/Marketing Committee and Outreach Coordinator for the Allegheny County Transit Council) were already there. A short while later, Stu arrived after riding his motorcycle in. We ended up hanging out at Caribou Coffee for a few hours, just jabbing on and on about transit. I’d brought along some transit literature from the Pacific Northwest with me, which I showed to everyone. We also ended up doing a comparison of our various transit passes, which you can see here. Stu ended up having to leave a bit early, as he had to get to work early in the morning. A little bit later though, he ended up tweeting us to ask if we could help him push-start his motorcycle. After two tries of pushing it up Lothrup Street (the first time about 3/4 of the way up and the second time all the way up), he got it started and headed back for his house. As it was getting late, we ended our little transit party around 10PM or so. The last 28X left Oakland at 10:55, so I didn’t want to push my luck and end up stranding myself somewhere in Pittsburgh and miss my flight out the next morning. Though I only got to visit for just a couple of days, I got to see quite a bit of Pittsburgh and enjoyed a first hand look at the problems and successes local transit was having. It was an interesting experience to say the least, but I’m very grateful to my “hosts” for the hospitality they showed me. Without a doubt, I know I will visit Pittsburgh again someday, and my hope is that I will have more time to visit and take in the sights next time. It took you a year to write it, then it took me two weeks to read it. Yep, it’s pretty much what I remember. It’s too bad we didn’t get you on one of the 45-foot, three-axle Neoplan over-the-road buses (our 1900 series, sorry, I don’t know the exact model). They’re getting long in the tooth, and are likely to be retired in a year or two. A couple of the original 40 have already been scrapped. Anyway, I’ll add a bit more info about the ACTA cutaway service. I used it regularly in the year I worked at FedEx Ground in Moon Twp. The way the system works, individual employers have to subscribe (i.e., pay in) to the service. The fee is based on the number of people employed there, not by the number who might use it. So, FedEx, being huge, paid the top dollar, a few thousand a year. A tiny coffee shop might pay a couple hundred a year. ACTA would take you to the front door of any employer that paid in, but your employer had to participate for you to use it. It wasn’t open to shoppers, for example, just employees. Some of the fast food places participated, since it was often easier to get employees from the city than from nearby suburbs. And for every worker who got there by bus, that freed up a parking space for customers, which mattered in a fast food place. ACTA worked reasonably well most of the time. But much of the reason I began tweeting my commute — my early big use of Twitter — was to document my daily trip, which could be so variable. I say all that mainly to explain how we really met in the first place, via Twitter, talking about transit. Meeting you in Pgh and showing you around was tangible evidence that there really were real people on the other end of a tweet! And thanks again for helping me get the motorcycle started! Hope to see you in Pgh again sometime!